This morning the Vatican published a letter written by Pope Francis addressed to families throughout the world. In it the Holy Father calls to mind the upcoming Extraordinary Synod of Bishops in October that will discuss the theme of “pastoral challenges to the family in the context of evangelisation”. This will then be followed by and Ordinary Synod to be convened in 2015. 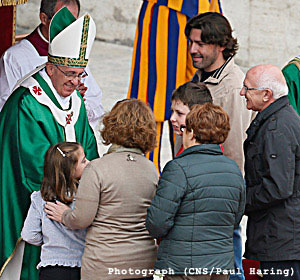 Pope Francis tells families that he is writing to them to “come into your homes” and encourages families to pray for these synods “so that the Spirit may illumine the Synodal Fathers and guide them in their important task”. In referring to the Synod Pope Francis calls to mind the very Vocation and Mission of family life in the Church and the world. Pope Francis initially produced the letter on the Feast of the Presentation of the Child Jesus at the Temple (February 2nd). A feast dedicated to the family itself. This entry was posted in Announcements, Francis, Marriage and Family Life, The Holy Father and tagged Extraordinary Synod on the family, Letter to families, Pope Francis. Bookmark the permalink.